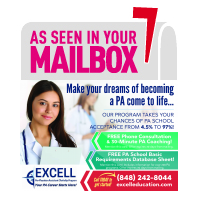 If you’re racking your brain to come up with direct patient contact experience, stop for a second and consider all of the direct experience you get just through the Excell Pre PA Assistant Clerkship program! Not only do you get over 200 hours of real-life patient experience over the course of your clerkship, you’ll come out the other side being able to speak directly to your role as a patient advocate and liaison. By the time you’re done, you’ll have developed skills in bedside manner, gotten direct patient interaction, detected and resolved patient quality of life issues, worked as a liaison between patients and staff, experienced being part of a healthcare team, and more! During your interview, you’ll want to share your Excell clerkship experiences with your interview committee. Be sure you don’t gloss over the program without expanding on just how valuable the program has been to your growth as a potential candidate. Which response adds more value? The second response doesn’t really dive into your role during the clerkship nor does it highlight the experiences you had. When possible, don’t shy away from the details of your patient contact experiences and always highlight any chances you’ve had to improve your skills. After you complete the program, you’ll be able to add even more detail to your response! Join our mailing list for valuable insight into the PA profession - plus, discounts on our critically acclaimed books and proven pre-PA program! We'll never sell or misuse your information.